Southern Tuscany is an undiscovered jewel, the area provides both a cultural feast and a natural one. A world off the beaten track, where wooded hills, valleys, rivers and lakes frame a unique historical and archeological paradise. From the Etruscans to the Romans and from the Middle Ages through the Renaissance to our present times, history of mankind has left, layer after layer, its trace in an incredible succession. It is difficult to find elsewhere so many memories of different eras all together and in such a special setting. From the stunning coastal paths of the Cinque Terre to the mountain lakes of the Dolomites and the artistic treasures of Tuscany, follow ancient paths through vineyards, olive groves and colourful villages and discover the timeless beauty of Italy. The territory of the Val d'Orcia is made up, mainly of a hilly landscape with gently rolling hills and valleys typical of the Sienese Crete and a rich variety of vegetation. The territory of Val d’Orcia includes the entire surface of five municipalities, Castiglione d’Orcia, Montalcino, Pienza, Radicofani and San Quirico d’Orcia. The river Orcia springs from a gorge and winds its way across the valley. The hike from Montalcino to San Quirico is set between vineyards and grain fields. The perfect trail for quiet contemplation that will provide a wonderful frame of outstanding natural beauty. In San Quirico, visit this small, absolutely charming town with its beautiful buildings and fortified walls, shops, restaurants and cafés. There is a lot to see, the Collegiata Church, Palazzo Chigi, Church of San Francesco, Santa Maria Assunta and Horti Leonini. Don't forget your water because it can be warm as early as April or late September. The territory of the Val d’Orcia is mainly covered of gently rolling hills. The river Orcia springs from a gorge and winds its way across the valley. The Val d’Orcia has a long geographical history: it’s 5 million years old. The two volcanoes of Southern Tuscany, Radicofani and Monte Amiata, are partly responsible for its appearance: they covered the surface with lava, which then became a type of rock known as trachyte. Erosion processes played a major role in the formation of the landscape with the clay soil laid bare and forming craggy badlands known as calanchi and clay knolls otherwise called biancane, which can be seen in the areas of Casa a Tuoma (Pienza), Ripalta (San Quirico), Lucciolabella, Beccatello, and Torre Tarugi (Pienza), Contignano, Pietre Bianche and the Poggio Leano (Radicofani). North west of Bagno Vignoni the Val d’Orcia has a less typical landscape, with woodlands and Mediterranean maquis that alternates with the vineyards of Montalcino and then continues towards the sea. On the slopes of Monte Amiata there are forests of beech and chestnut trees. 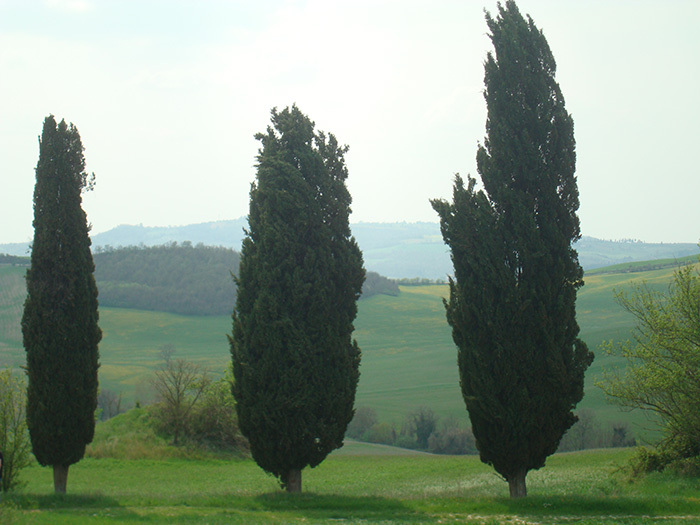 Other tree species found in the area are the oak and obviously the tree which has become the symbol of the Val d’Orcia: the cypress. Renowned most of all for producing the exquisite Brunello wine, famous throughout the world, Montalcino also has many other aspects full of historical and cultural interest. There is much to explore in this medieval town with its gardens and orchards, steep streets offering picturesque views and excellent museums and churches. Initially privileged because of its strategic position on the via Francigena, Montalcino was later conquered by the powerful Siena. The town walls were built in the 13th century, while the fortress, built on the highest part of the hill at the top of the town, was designed by an architect from Siena in 1361. Montalcino's main attraction is undoubtedly Piazza del Popolo with its Palazzo dei Priori and the high-rise medieval tower. Montalcino experienced long periods of peace and prosperity interrupted by a series of extremely violent events, and even if in the Late Middle Ages it was an independent commune with considerable importance (thanks to its strategic position on the Via Francigena). As well as many other medieval villages in Tuscany, Montalcino came under the influence of the powerful city of Siena. In 1260, Montalcino was deeply affected by the conflicts in which Siena was embroiled, particularly in those with the city of Florence; after the fall of Siena (1555) the Sienese nobility took refuge in Montalcino for 4 years in the hope that they could come back to Siena, but in the end the city was amalgamated into the Grand Duchy of Tuscany up to the Unification of Italy (1861). The Fortress was built at the behest of the Sienese government, starting in 1361, was reinforced with an external bulwark after Montalcino capitulated in 1559, when the Florentines, to commemorate their conquest, mounted the Medici coat of arms, six balls, on the southwest bastion, where a hanging garden of ilex trees was planted and can still be reached from the courtyard. The Fortress, known as La Rocca, is undoubtedly one of the pillars of Montalcino architecture. It was built in the town’s most accessible spot, facing the Albergheria hill below it and dominating Montalcino with a scenic impact of rare beauty. From the ramparts of the 14C fortress, there are magnificent views across the famous valleys of Orcia, Ombrone and Asso. The surrounding towns of Montepulciano, Pienza, Monticchiello, San Quirico d’Orcia and the nearby Abbazia di Sant’ Antimo and Castiglion del Bosco all combine to create a feast for exploring. 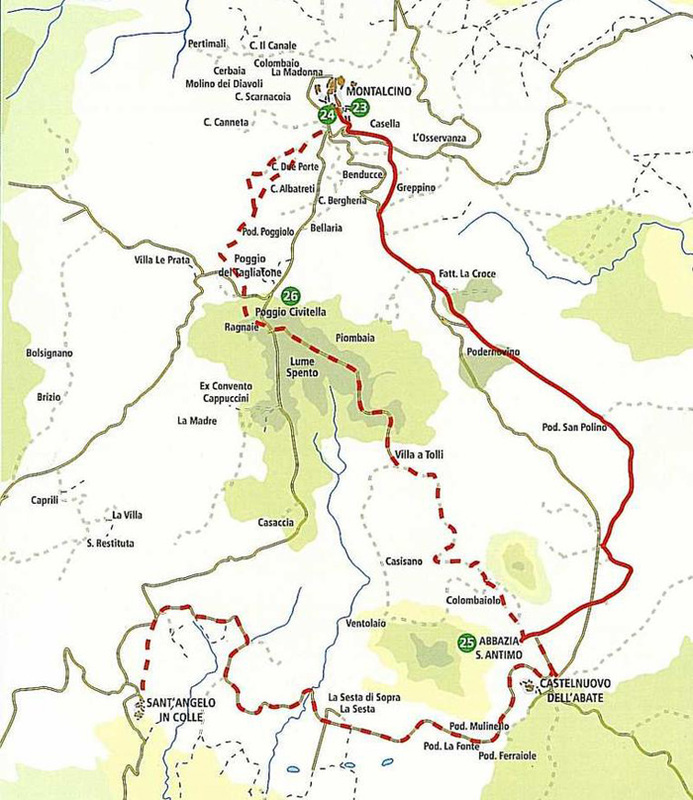 The via Francigena, a Medieval pilgrimage route connecting northern Europe with Rome, winds in the vicinity of Montalcino. Bosco. Castiglion del Bosco's Castello is built in classic medieval style. Its form is similar to that of Rocca of Tentennano, a rocky crag upon the medieval suburb of Rocca D'Orcia in the Val D'Orcia. In the early 13th century, the family of Cacciaconti of Trequanda surrounded the hilltop bastion with stone walls. Still standing today are remnants of the walled enclosure, a gate and the partially destroyed Castello. In 1345 Pietro Lorenzetti painted the fresco "Annunciazione dei Santi" in the Church of San Michele in Castiglion del Bosco's Il Borgo. It was rediscovered in 1876 and fully restored to its original glory. Pietro and his brother, Ambrogio Lorenzetti belonged to the famous Sienese School which flourished during the late Middle Ages and foreshadowed the art of the Renaissance. In 1967 Castiglion del Bosco became one of the founding members of the Consorzio del Vino Brunello di Montalcino. The organization was created as a voluntary association of producers who regulate and control the quality of Brunello production. Brunello di Montalcino was among the first Italian wines to be granted the titles DOC (Controlled Denomination of Origin) and DOCG (Controlled and Guaranteed Denomination of Origin). This is an easy walk on country roads that offers splendid views of Val d'Orcia (recognized as a World Heritage Site by Unesco), Amiata and Maremma. It leads to the Abbazia di Sant'Antimo, a breathtaking Romanesque abbey. The monastery, partly rebuilt, is home to San Norberto monks who still celebrate the mass with Gregorian chanting. W alking in and out of woods and then along a very panoramic dirt road, we reach what has been recognized as the most extraordinary example of Romanesque architecture in Tuscany: the abbey of Sant'Antimo. A community of monks live in the Monastery, taking care of their land and enchanting all the visitors with their Gregorian chants. Villa a Tolli is an ancient hamlet of Etruscan origin, with an high historical value, architectural and landscape situated in the heart of Brunello. Dating from 1200, it’s on the Roman road leading the north of Tuscany to the Abbey of Sant’Antimo and Montalcino. The name “Villa a Tolli”, however, dates back to the Etruscan period in which the word “tollee” meant “elevated place” This is where a very ancient settlement from the 4th and 5th Century before Christ has been recovered; just a few meters away from the actual Borgo. The peculiarity of this settlement is the way in which it had been fortified: three great concentric rings of well-preserved walls. The Abbey of Sant'Antimo, in a picture-perfect setting, just about 26 km north of Podere Santa Pia, and 10 km south of Montalcino, dates from the 12th century. It's one of the finest Romanesque religious buildings in Italy. The Abbey is on the Via Francigena and it seems that its founder was Charlemagne. The story goes that, between 774 and 781, he received the relics of St. Sebastian and Sant’Antimo from pope Hadrian and founded in their honour one of the most important monasteries in Tuscany. Nearby the town of Sant'Angelo in Colle, an enchanting well-preserved village on the top of a hill contained in its circle of walls. From the Abbey of Sant'Antimo, a footpath (6 km) leads to Sant’Angelo in Colle. Palazzo Cervini in Vivo d'Orcia was commissioned by Pope Marcello II and was built by Antonio da Sangallo, the famous Vatican architect that built the Pope’s living quarters. The present Count and Countess (descendants of The Pope Marcello II) are still in residence today. A Romanesque chapel and an extensive hermitage (Eremo) were also constructed to accommodate for a fascinating group of humble monks, known as the “Camaldolesi”, who first inhabited the caves that now form the foundations of the castle in 1,004 ad (500 years previously). This hermitage exists today, a place for peaceful contemplation and where one can truly be at one with nature and it’s beauty. You first have to get to the village of Vivo d’Orcia, located on the northern side of Mount Amiata (at 900m above sea level), and accessible by either one of these two roads: the Strada Provinciale 65 or the Strada Provinciale del Monte Amiata. You’ll have to negotiate a few hairpin curves and bends on your way up, but I’m sure you’ll enjoy this part of the trip too. Once in Vivo, drive across the village in direction of Contea. On your right side, you will see a narrow street going down at some point. Venture into it and cross the moss-covered bridge that will soon dawn on you at the bottom of the slope. On the other side of this bridge, called the Ponte degli Innamorati (the Lovers’ Bridge), you will have reached your destination. 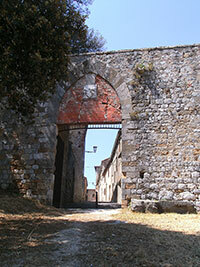 You will see two gates: one leading to an old hamlet (definitely worth a visit); the other, to the Palazzo Cervini. From Vivo d’Orcia we start downhill on Via dell’Eremo toward the white-fir forest of Vivo d’Orcia, one of the last remaining in Tuscany of this kind. At the end of the road we cross the bridge over the Vivo stream passing under a stone arch that leads to the Borgo dell’Eremo. Very few houses are clustered around the XVI century Palazzo Cervini and the church of San Marcello. We proceed going back to the stone arch without crossing the stream, turning left on a footpath that starts at a gate and some stone steps that climb up to the fir-woods. We carry on for about 10 minutes up to a junction where we turn right along a path that leads to the asphalted road (Vivo-Seggiano). Here turning left we carry on downhill for about 200 m to another junction where the right turn will lead us steeply uphill to the equipped area of Lo Scudellino. Castelmuzio, is part of the commune Trequanda under the province of Siena. This ancient village dates back to the time of the Etruscans, and is built on a volcanic limestone hilltop overlooking an amazing landscape. Over the years it has been called by several names, Castel Mozzo and later Castello. You can see the old city walls and ramparts, including the embrasures through which cannons were fired. The village includes three churches. The most famous is the Pieve di Santo Stefano in Cennano, just outside the village. Sant' Anna in Camprena, is an ancient convent between Pienza and Castelmuzio where parts of The English Patient were filmed. The monastery contains remarkable frescoes by Sodoma. Trequanda stands on the top of a hill, deep in unspoilt countryside of woods, vineyards and olive groves. This former medieval hamlet wasresidence of the Cacciaconti family until the 1500s. A third of the village is taken up by the castle Cacciaconti and its various annexes including a small ornamental garden. The majestic stone tower, partly rebuilt after the war, dominates the entire complex from the north-east and is a singular witness to the original fortified castle structure. From the airy town square where stand the castle, town hall and the splendid romanic church of SS. Pietro and Andrea church of SS. Pietro and Andrea (which contains a fresco by Sodoma), steep and narrow roads and alleys descend where the attentive visitor will be surprised to find ancient covered passages, small votive ceramics, family crests, and beautiful benches in travertine and tufa. 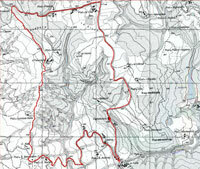 East of Trequanda you reach Sinalunga. Among the most interesting monuments to see in Sinalunga we point out here the Collegiata di San Martino (Saint Martin Collegiate Church), the Chiesa di Santa Croce (Saint Cross Church), the Chiesa di Santa Lucia (Saint Lucy Church), the Pieve di San Pietro ad Mensulas (Saint Peter ad Mensulas Parish), the Chiesa di San Bernardino (Saint Bernardine Church), the Palazzo Pretorio (Praetorian Palace), the Teatro Ciro Pinsuti(Ciro Pinsuti Theatre) and the Antiquarium. Pienza, situated in the province of Siena, in the Val d'Orcia between the towns of Montepulciano and Montalcino, is the "touchstone of Renaissance urbanism. Pienza was rebuilt from a village called Corsignano, which was the birthplace of Enea Silvio Piccolomini, a Renaissance humanist who later became Pope Pius II. Once he became Pope, Piccolomini had the entire village rebuilt as an ideal Renaissance town by the Florentine architect Bernardo Gambarelli. Around Piazza Pio II, the Piccolomini and Borgia palaces and the cathedral are a testimony to this extraordinary vision which has made its historic centre one of the finest in the world. Outside of the historical center of Pienza, is the Romanesque parish church Pieve di Corsignano, characterized by a cylindric tower and a decorated fortress with mythological and fantastic themes. There are two stunning decorated portals, a cylindrical belfry, and all the sculptures that the stonemasons left on the inside and the outside of the church. Of particular interest is the miniscule crypt under the presbytery. Pienza is known for its pecorino, a fresh sheep cheese. Solitary cypresses or lining in long rows ancient country roads, vineyeards which follow the ups and downs of rolling hills, streams overshadowed by trembling poplars, oaks and holm-oaks woods, strawberry trees and brooms growing on the banks of the roads, they make up the landscape which can be enjoyed on approaching Castelmuzio, the old, suggestive medieval village in the heart of Tuscany. 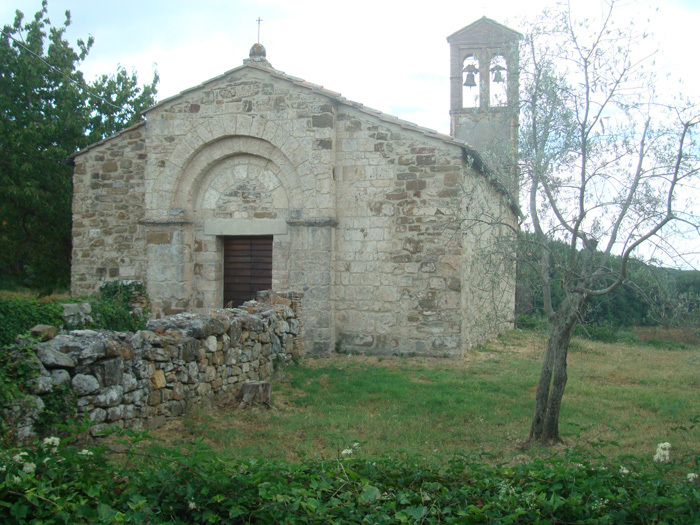 The Chapel of Our Lady of Vitaleta is a small sacred building is located on a hilltop on the road that connects San Quirico d'Orcia to Pienza. 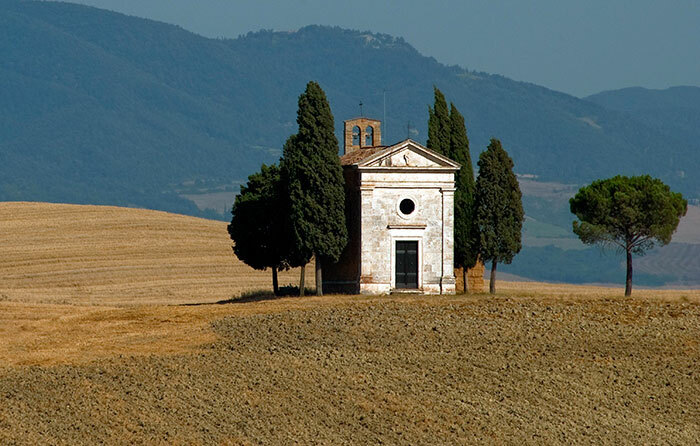 Isolated on the rolling hills between Pienza and San Quirico d'Orcia, the Vitaleta chapel and the adjacent farmhouse are easy to miss, even if they are among the most famous icons of Tuscany, as they are standing away from the main road. Make a walk from Pienza to the Capella di Vitaleta. It is a beautiful way to immerse yourselve in this rolling land of the Val d'Orcia. South east of Pienza are Castelluccio di Pienza, a medieval castle, La Foce and Montichiello, a small centre in the heart of the Orcia valley whose beauty derives from its geographical position and the harmonious integration of its medieval architecture. The Nature Riserve Riserva Naturale Lucciola Bella is situated south east of Pienza and Montichiello, in the Val d’Orcia, which stretches up to Chianciano Terme. The riserve is in a small corner of the typical landscape of the crete senesi. In fact the striking feature of the nature reserve is this unusual landscape of the calanchi and biancane, typical erosive features of the Crete Senesi landscape, mainly linked to grazing activities: they house important and exclusive vegetational and ornithological aspects. Monticchiello is a small centre in the heart of the Orcia valley whose beauty derives from its geographical position and the harmonious integration of its medieval architecture. Monticchiello still retains its old walls, towers and castle , the village inside the fortifications has maintained intact its medieval characteristics. Walking down the main street, there is the church of S. Agata. The 13th century Church of Santo Leonardo e Cristóforo, with a Gothic facade, contains an altar-piece of the Virgin and Child by Pietro Lorenzetti. Special event is the il Teatro Povero, the Poor Theatre, a most impressive and clear sign of the town's vitality. Every year a new production, written, conceived and directed by the people of Monticchiello' returns to speak of past, present and future events of this community. Montepulciano is in a near-idyllic location in the heart of the Tuscan countryside, between Pienza and Chiusi. The town centre ramparts encircle the historic heart of the town. The Renaissance-style palaces (Avignonesi, Communal, etc.) draw the eye along the streets surrounding the charming main square Piazza Grande. The Corso, a long, winding street climbs up into the main square, which crowns the summit of the hill. Below the town, the Madonna di San Biaggio monument is a sight not to be missed. Built of honey - and cream - colored travertine, it is Sangallo's masterpiece. Montepulciano is chiefly known for its good local Vino Nobile wines. You can conveniently start exploring the town, from either one of its main gates: Porta al Prato or Porta delle Farine, where buses arriving from Siena and Florence stop. This tour starts from the Church-Convent of Saint Agnes outside the city walls. Beyond Porta al Prato, one of the gateways to the town built by Antonio da Sangallo The Elder, we are on the main street of the old city called Il Corso. The many sumptuous residences and buildings you can admire while walking in the historical center still testify to the power and wealth of the noble families here during the 14th and 15th centuries, although it was in the 16th century that Montepulciano reached its highest splendour under the powerful Medici family. A gentle up & downhill walk from the magnificent town Montepulciano to the perfect place Pienza along the beautiful scenery of Toscany. The walk starts at the Piazza Grande, next to the Duomo. Montepulciano is often associated with Montalcino and Pienza in the list of the must-see in Val d’Orcia. The town is actually in Val di Chiana. Montefollonico was a Medieval hamlet which marked out the Siennese Republic border. Cut off from the big arterial streets it has kept intact his structure and its timeless atmosphere after centuries. Montefollonico was built on pre-existing Etruscan and Roman settlements. Its name is from the Latin word fullones, that is the name given to the wool workers (Monte a Follonico = place were the wool is worked). Montefollonico is for great part encircled by the medieval stone walls, in some points dismantled, endowed by seven round towers and three gates: the Porta del Triano, the Porta a Follonica and the Porta del Pianello or Porta Nuova (or also called Senese). This was the main town gate, a great example of fortified architecture of 14th century. The hike from Montepulciano to Montefollonico takes about three hours. Chianciano Terme stands on a hilltop overlooking to the west the Chiana valley, between Chiusi and Montepulciano. Chianciano Vecchia, as is called the ancient town of Chianciano, is very different from the modern quarter that has grown all around the Terme. It is situated on a hill and shows part of its medieval town walls and its medieval urban plan. The gate of the town is at the end of Via Dante, where stands Porta Rivellini with its elegant Renaissance structure. Today, Chianciano Terme is considered among the finest health resorts in Europe. La Foce is a vast family-owned estate in an idyllic rural setting. Several walks cover the huge La Foce Estate brought to life so vividly by Anglo-American writer Iris Origo in her famous war diaries and includes a beech forest, pre-historic caves and an unforgettable view over the south Siena district. You visit the ancient village of Castiglioncello del Trinoro before returning to La Foce through oak woods. At the end of the walk there is an opportunity to visit the famous Italian style gardens created for Iris Origo by Cecil Pinsent at the villa of La Foce. The property of La Foce lies on the hills overlooking the Val d'Orcia, a beautiful and miraculously intact valley in Southern Tuscany. The countryside abounds in lovely walks among woods and the characteristic crete senesi (clay hills); the food is among the best in Tuscany and famous wines such as vino Nobile and Brunello can be tasted in the local cellars. Known as an important settlement from Etruscan times (a burial-place dating from the 7th century BC to the 2nd AD has been recently excavated on the property), La Foce has been continuously inhabited for many centuries. Later, its strategic position on the historical Via Francigena leading to Rome greatly increased its significance. The Villa itself was built in the late 15th century as a hostel for pilgrims and merchants traveling on this busy road. In 1924 the property was bought by Antonio and Iris Origo, who dedicated their lives to bringing prosperity and cultural and social changes to this poverty-ridden land. Today the estate - a combination of woods, cultivated fields and olive groves - is run by the Origo daughters, Benedetta and Donata. After visiting Villa La Foce, we start our journey that will take us all the way to Castelluccio. Paved roads before and then white trails, with short deviations to discover the beauty of nature, roads bordered by cypress trees that take us to discover the natural reservoir of Lucciola Bella. Monte Cetona (1148 m) is in the south eastern section of Tuscany, near the border with Umbria. Surrounded by and overflowing a double ring of medieval city walls, Sarteano is a small hill in southern Tuscany on the ridge of Mount Cetona. Sarteano is crowned with the ruins of a castle dating from around 1100. There are a number of ancient churches in the town, including the monumental complex of the ex-convent of Santa Chiara from the order of the Clarisse (1498). The annual Giostra del Saracino takes place every August 15th. To the southeast is found Mount Cetona, Radicofini, visible for miles around, its castle topping the solitary high plateau, the restored (privato) abbey of Spineto dating from 1016, Fonte Vetrianna, an isolated settlement with Etruscan and Medieval beginnings and the mineral springs of Bagno Santo. San Quirico is a charming, walled town on the northern edge of the Val d'Orcia of southern Tuscany. Located in a strategic position along the Via Cassia (and the old Via Francigena ), San Quirico d'Orcia was often the residence of imperial bailiffs.The more interesting and beautiful building of all San Quirico d' Orcia is without doubt the magnificent Collegiata di San Quirico or Pieve di Osenna. Behind the altar, the magnificent, inlaid panels, by the Siennese Antonio Barili, date from between 1482 and 1502. On the left side of the third arcade it's the tombs of Count Enrich of Nassau, who died in San Quirico in 1415. The Horti Leonini, laid out by Diomede Leoni in 1580, is a superb example of the Italian garden. The enormous garden opens into a wide perspective flight, the effect of which is helped by the perfectly geometrical beds of box hedge. During the summer months, Horti Leonini is a public sculpture garden. Bagno Vignoni is a spa town of medieval origin, just south of San Quirico d'Orcia where the main piazza is a large basin of water. The basin was built by the Medici and was used by various popes and saints. The fascinating village, is clustered around a large pool closed on three sides by the town walls, whith water that flows at 52°. the Parco dei Mulini or Mill Park. The Mill Park was created with the intention of safeguarding and making the most of one of the main milling centres on the Siena territory. With four mills it had an enormous potential in an area like Val d’Orcia, particularly dedicated to growing cereals but with little water available. Exploitation of the spa source, with its constant delivery, meant that milling could be carried on also in summer when most mills were out of commission. Castiglione d'Orcia marks the boundary between Val d'Orcia and the Monte Amiata forests. The centre of the town, with its stone-paved streets, is picturesque, and the Piazza il Vecchietta is particularly interesting. This square is dedicated to Lorenzo di Pietro (1412-1480), called II Vecchieta, who was painter, sculptor and architect. The ring walk in the area of San Quirico and Rocca d'Orcia, passing through Bagno Vignoni and Castiglione d'Orcia, is a classic walk in Tuscany. The walk from Ermicciolo to Eremo, along the river, is absolutely one of the finest in the Amiata trails: you can stop at the little waterfalls and the dam in the middle of the woods, or the caves where partisans hid during the last war, or the archaeological sites that have brought to light finds dating to Mesolithic and Etruscan civilisations. You may even see one of the rare green woodpeckers whose sound is sometimes heard echoing among the centuries-old trees.